Are you learning about the Core and searching for a six pack? 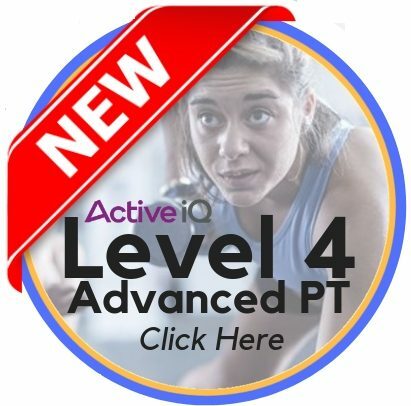 You may already be a fitness professional or considering to become one, it’s here you will find out exactly ‘what core training is’ and some great core exercises too. You’ll learn how to train the core effectively and more so understand where we go wrong in searching for the six pack. In recent years ‘Core Training’ or more specifically ‘Core Stability Training’ has become extremely popular across gym and sporting environments. The development of a strong and stable core is championed by many as the key to improve/pain free function and sporting excellence. So what exactly is the Core? Quite simply, if the arms and legs are discounted, the core is what remains. Often the core is considered to include only the abdominal and lower back muscles. This is too narrow a view as the hip and upper back muscles should not be overlooked. To truly appreciate the structures involved, it is useful to think of the body as being composed of a series of muscle layers – deep, middle and outer. are responsible for large motions of the body and allow many functional tasks, such as bending and lifting, to be performed. 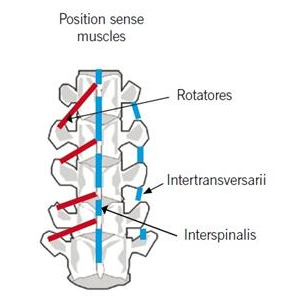 In contrast, accessory muscles are responsible for controlling movements that occur within a joint, an example would be when bending to pick up an object from the floor the spine moves into a flexed position, but there is also accessory movement at each vertebral segment. Each segment depending on the task will bend, slide (shear) or rotate on top of each other. To control all accessory motions, there are small position sense muscles that cross from one vertebral segment to another. 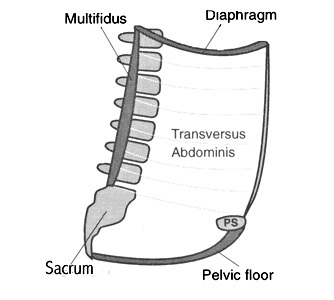 M iddle layer muscles include the transverse abdominis (TVA), internal oblique, lumbar multifidus, diaphragm and pelvic floor. When these muscles contract they create a non-compressible cylinder where the spine is stabilised and forms the working foundation from which the arms and legs can function optimally. Richardson et all (1999), showed that inner unit activation occurs prior to involvement of the extremities and that faulty inner unit recruitment increased the likelihood of low back dysfunction. Outer layer muscles include rectus abdominis, external obliques, erector spinae, latissimus dorsi, the gluteals and the adductors and together form muscle slings. These muscle slings contribute to the ability to maintain an optimal working relationship between joints and to integrate the various body segments for successful motion. As these are the muscles that people can see they generally assume that these are the only ones that exist. This is where the myth of “core training will get you a six pack” generally comes from. In fact, the “six-pack” is just the rectus abdominis muscle – which we all have as part of our outer core layer; most client’s that are searching for a six-pack should start their journey in the kitchen, as they only thing hiding the rectus abdominis is an accumulation of fat around the mid-section. Note: It should not be seen that the core is made up of muscles from all three muscle layers. The core (trunk) can be thought of as the ‘crossroads’ of the body, providing a link between the lower and the upper body. With the above in mind, the main focus of core training is to address any functional deficit in trunk stabilisation and/or movement in order to provide the necessary spinal support and a strong and adaptable platform for the action of our extremities. Next time your client asks you “what core exercises can I do to find my six-pack?”, refine what their goal actually is and consider whether core training will give them the results, or whether nutrition is their answer. Next time a client is looking for improved posture, better body awareness and spinal support then Core training exercises and education should definitely feature in their programme. Therefore, every client should be doing core training- but remember core stability training is anything where the middle section and spine stays still whilst the limbs move – so even walking counts, if they have the awareness of their movement whilst doing. So, use this new information about the core to get creative, and keep it appropriate to their goals. If your mock questions show that you really are not ready, then it may be that you are not learning the infomrtion in a way that suits your learning style. 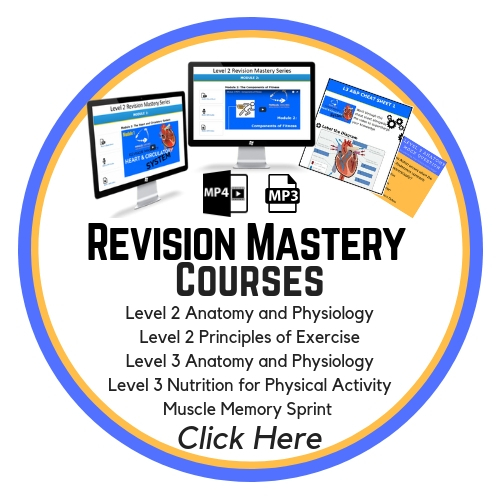 The fastest way to accelerate your learning and revision is to check out the Revision Mastery Bootcamps. 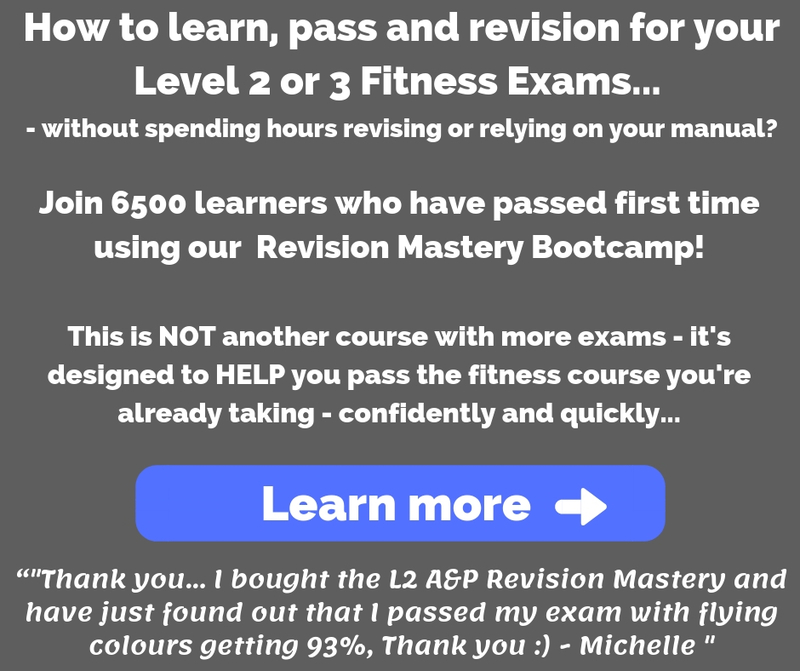 These give you EVERYTHING you need to learn, revise and pass your fitness exams. Each boot camp has multiple HD video tutorials that break down your entire course manual and exam into the relevant modules, making learning structured and guided to exactly what you must know ready for your exam.